The high-performance mixing unit (farmers biodiesel reactor) is designed for mixing of liquid components to create mixtures for further processing in primary reactor. The unit? ?™s design allows for instant mixing of any liquids. Such mixing can create new substances, as well as saturate existing substances with additives. The unit can be used for production of biodiesel fuel. The unit must be operated in well-ventilated areas with forced exhaust ventilation. Ambient temperature range +5 to +35 degree Centigrade. The unit is designed as a single assembly, consisting of a metal frame with all components mounted on it. Pipelines provide connection between corresponding components. Figure 1 shows general view of the unit. Figure 1. USB1-06 general view. 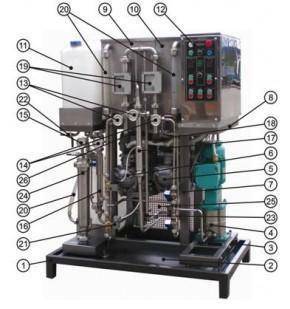 1 – frame; 2 – base tray; 3 – methanol solution pump support; 4 – methanol feed pump; 5 – oil feed pump; 6 – pump; 7 – stands; 8 – support; 9 – oil tank with electric heater; 10 – methanol solution tank; 11 – crude biodiesel tank; 12 – control cabinet; 13 – pressure and vacuum gauge; 15 – vacuummeter; 16 – complementary hydrodynamic mixer; 17 – primary hydrodynamic mixer; 18 – regulating valves; 19 – flowmeters; 20 – level indicators; 21 – electric valve; 22 – ball valves; 23 – piping; 24 – residual methanol removal; 25 – railing; 26 – thermistor. The unit is a single assembly, consisting of frame 1 (fig 1). Mounted on the frame are methanol pump support 3 with the pump 4, residual methanol removal support and assembly 24 and the stands 7, to which support 8 is welded. Residual methanol removal section is a vessel containing ion-exchange resin, which removes residual methanol from passing crude biodiesel. This section is equipped with level indicator to monitor oil processing. A support is welded to the stands in the back of the unit. The support holds pumps 4 and 5. Railing 25 is attached to the stands from the side of the pumps. Support 8 holds oil tank 9, methanol solution tank 10, crude biodiesel tank 11 and control cabinet 12. Tanks 9 and 10 are assembled in one thermally insulated section. An electric heater is installed in the oil tank for pre-heating of oil. Thermistors 26 supply temperature information to measuring regulators for oil and methanol solution temperature control. The measuring regulators are located in the control cabinet 12. Level indicators 20, installed in tanks 9 and 10, show liquid level in the respective tanks. Biodiesel settling tank is a plastic 30 liter vessel. Control cabinet 12 is a rectangular unit with controls mounted on the front panel with electric communications inside. All assemblies are interconnected by piping system 23, which includes manometers 14, vacuum manometers 13, vacuummeter 15, complementary hydrodynamic mixer (mill) 16, primary hydrodynamic mixer 17, regulating valves 18, flowmeters 19, electric valves 21 and ball valves 22. During operation of the unit, primary process parameters (oil and methanol solution temperature, pressure of the liquid downstream from the pumps and in the hydrodynamic mixers, flowrates of oil and methanol solution) are displayed on the indicators located on the front panel of the control cabinet. To avoid spillage of the product on the floor, the unit is equipped with a base tray 2 with connector for spillage drain, at the bottom of the frame 1. Tank 1 and tank 2 are filled with oil and methanol/KOH solution (pre-determined ration) respectively. After that oil is heated and circulated through pump B1 valve VE1 until temperature reaches 60 degrees Centigrade. 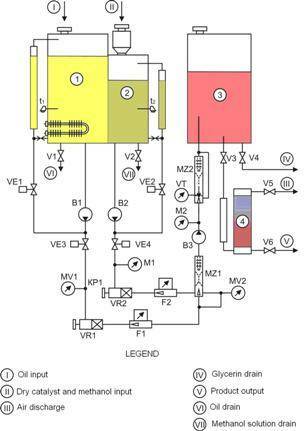 Likewise, methanol and base are mixed, circulating through pump B2 valve VE2 until base is completely dissolved in methanol (20-30 minutes). Following the preparation, mixing mode and component feed are switched on. In this mode, valves VE3-VE4 are open and pumps B1-B3 are on. Crude biodiesel tank is filled, after which the product is separated by settling. After settling, glycerin phase is discharged through valve V4, and biodiesel enters residual methanol removal section 4. After treatment finished product flows to valve V7 and further to finished product tank. Process parameters (amount of components entering the mixer, pressure, vacuum) are monitored using the corresponding instruments installed on the unit. Correction valves VR1 and VR2 allow for fine adjustment of component dosage. Valve V5 allows for discharge of air from methanol removal section when it is being filled with biodiesel.